Dubai, October 21, 2018: The world’s largest annual airport exhibition in Dubai is going to be power-packed when it returns for its 19th year run in April 2019 with a record 375 exhibitors expected from 60 countries. To be held under the patronage of His Highness Sheikh Ahmed bin Saeed Al Maktoum, President of Dubai Civil Aviation Authority, Chairman of Dubai Airports and Chairman and Chief Executive of Emirates Airline and Group, the Airport Show, organised by Reed Exhibitions Middle East, will take place at the Dubai International Convention and Exhibition Centre (DICEC) from 29 April - 1 May. About 7,500 attendees are expected to attend the B2B show, with 75 per cent exhibitors returning after a highly-successful 2018 participation. The show will take place over an exhibition space of over 15,000 square meters across three Zabeel halls of the iconic DICEC, with visitors and hosted buyers from across the world getting the latest insights from leading international exhibitors and industry experts. The aviation industry is soaring new heights of growth and expansion. An investment of US$90 billion is projected to go into the aviation industry in the Middle East by 2020; more than three-fourths of which is in the Arabian Gulf states alone. According to CAPA, US$255 billion is being invested in new (Greenfield) airport projects around the world. Together with the US$845 billion investment in existing airport projects such as new runways, terminal buildings and extensions, US$1.1 trillion in airport infrastructure projects are planned or underway. Currently, there are 415 new airport projects in the world, of which 64 are located in the Middle East alone. There are currently over 2,300 airport construction projects worldwide, varying from US$1 million to US$20 billion in investments. UAE airports are investing up to US$50 billion in new and expanded projects over the next 15 years, which will provide capacity for an additional 200 million passengers per annum. 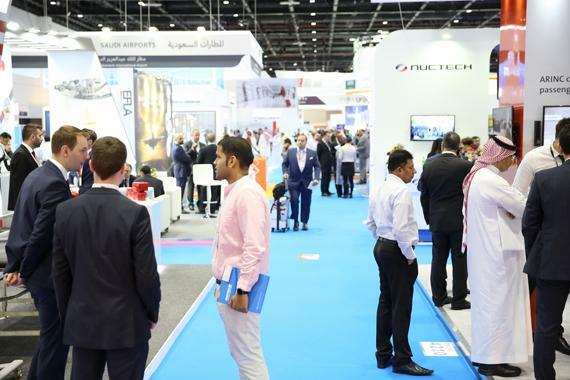 The Airport Show 2019 will have two co-located events: Air Traffic Control (ATC) Forum and Airport Security Middle East, as well as providing leading conferences: a newly-revamped Global Airport Leaders Forum (GALF), Women in Aviation (WIA) General Assembly and a new addition, CAPA’s Middle East & Africa Aviation Summit. The event will also focus on the theme of ‘Smart Airports’, which will bring together the most influential innovations that are shaping the design, features and day-to-day operations of the modern airport. Exhibitors who have breakthrough technologies will be highlighted on the show floor, a new Smart Airports Conference will take place on day 1 of GALF and the new Innovation Hub will present a selection of innovators from across the globe who will be showcasing their breakthrough technologies set to shape the future airport experience. A dedicated ‘Live Stage’ featuring CPD accredited industry presentations will also be available for all visitors to attend for free.